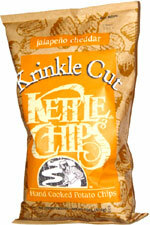 Taste test: These are top-notch chips. They're wide-rippled, thick, crisp and extremely crunchy. 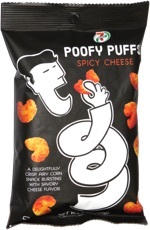 They're also really tasty, with a great combination of jalapeno and cheddar flavors. It's not a fire-hot jalapeno heat by any means, but there's a slight kick to these, with a definite jalapeno flavor to it, that comes up in the aftertaste, especially if you eat several of them -- which is hard to avoid once you've eaten one. Smell test: Very, very nice baked potato sort of smell, but no hint of jalapeño or cheddar.